Who’s the next Best Baker in America? This week, Food Network announced the TV show’s second season will premiere in May. Hosted by Scott Conant, the cooking competition series puts bakers to the test “to create elegant and delicious versions of classic baked goods, including a Skills Challenge that tests their mastery of the essential technical skills of baking, followed by a Master Challenge that tests the baker’s prowess working with specific flavors and ingredients.” Season two judges include Jason Smith and Marcela Valladolid. Season two of Best Baker in America premieres on Food Network on May 7th at 9 p.m. ET/PT. NEW YORK – March 28, 2018 – Nine world-class bakers compete for bragging rights and a cash prize in season two of Food Network’s primetime competition series Best Baker in America, premiering Monday, May 7th at 9pm ET/PT. Food Network’s Scott Conant hosts the competition as bakers from across the country are put to the test in each episode to create elegant and delicious versions of classic baked goods, including a Skills Challenge that tests their mastery of the essential technical skills of baking, followed by a Master Challenge that tests the baker’s prowess working with specific flavors and ingredients. Returning judges Jason Smith and Marcela Valladolid are joined by rotating guest judges, including baking digital influencers Yolanda Gampp, Joshua John Russell and Gemma Stafford, and prominent cake and pastry experts Florian Bellanger, Shinmin Li, Sherry Yard and Zac Young, to determine which bakers possess the artistry and creativity needed to advance through seven episodes, with one baker earning the grand prize of $25,000 and the title of Best Baker in America! The nine bakers competing for the title of Best Baker in America are: Becca Craig (Philadelphia, Pa. – Executive Cake Chef); Kym DeLost (Chicago, Ill. – Pastry Chef)); Jeremy Fogg (New Orleans, La. – Pastry Chef); Frania Mendivil (Los Angeles, Ca. – Executive Pastry Chef); Leigh Omilinsky (Chicago, Ill. – Pastry Chef); Lasheeda Perry (Atlanta, Ga. – Executive Pastry Chef); Max Santiago (Miami, Fla. – Executive Pastry Chef); Jean-Francois Suteau (White Sulphur Springs, W. Va. – Executive Pastry Chef); Adam Young (Mystic, Conn. – Bakery Owner and Head Pastry Chef). What do you think? Have you seen Best Baker in America? Will you watch season two? 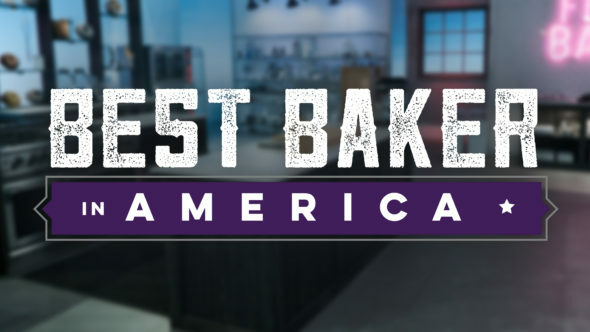 More about: Best Baker in America, Best Baker in America: canceled or renewed?, Food Network TV shows: canceled or renewed?